Sleep is vital for our physical and mental well-being, so there’s nothing worse than waking up after an awful night’s sleep. You feel absolutely exhausted, cranky, emotional, and all you want to do is crawl back to your bedroom and hit the hay. But, what if I were to tell you that your bedroom is the problem? All too often, people overlook the importance of a sleep-friendly environment and suffer massively as a result. If you’re struggling to get to sleep at night, and don’t know what to do, then here are eight tips to turn your bedroom into a sleep haven. You may like to view your bedroom as organised chaos, rather than plain messy, but either way, it’s not great for your sleep. You see, clutter, regardless of how you view it, can cause stress, and stress can prevent you from falling asleep. Because of this, it’s vital that your bedroom is clean, tidy, and organised. Your clothes should be in closets instead of on the floor, and things like treadmills and work desks should be moved to another room. 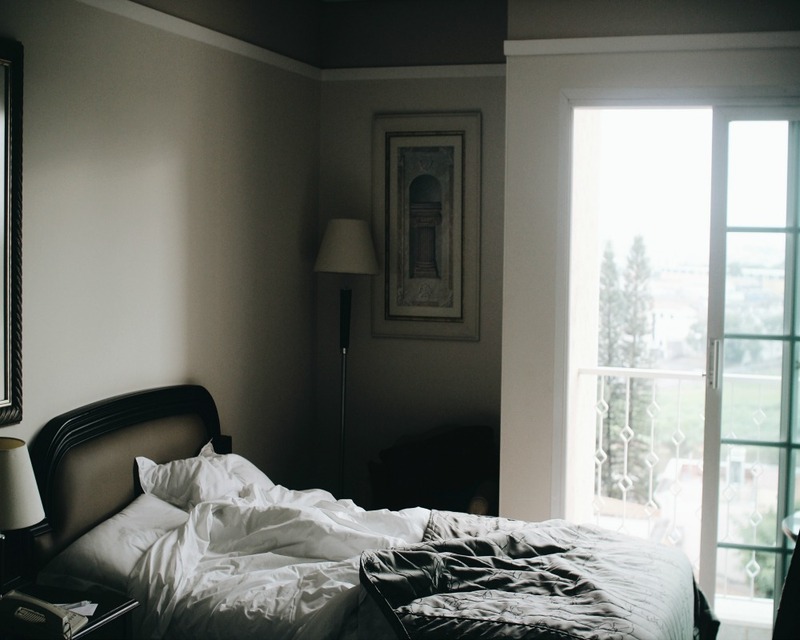 Your body knows that you’re supposed to sleep when it’s dark and wake up when it’s light, which means that, if there is any light shining in your bedroom throughout the night, you’ll automatically wake up, as your body thinks that it’s morning. Because of this, it’s important that you make sure your bedroom is as dark as possible. You can do this by turning off all of your lights before you go to sleep, and invest in a pair of blackout curtains or blinds, to eliminate any light outside. You will only know how uncomfortable your mattress truly is when you try out a few different ones, so make sure to take a trip to a mattress store as soon as you can. One of the best tips when mattress shopping is to take your time when testing them out, as you won’t know what’s right for you by simply looking at them. You need to have a proper lie down on every bed, and really think about your decision, rather than buying whatever everyone else suggests. Some people like cotton bedding, while others prefer silky, the same as some people like to sleep on several pillows, while others choose to have just one. It’s vital that your bedding is all about your likes and dislikes, or you’ll struggle to get comfortable, and won’t be able to sleep. Of course, you may have to compromise if you share your bed with a partner, but you should do what you can to ensure that you’re both as cosy as possible. When you start drifting into sleep, your body temperature naturally drops, which means that keeping your bedroom cool is a great way to ease you into sleep and avoid you waking up. To do this, you should simply lower the temperature on your thermometer, or turn on a quiet fan during the summer. Of course, if you get too cold, this may also make it difficult to fall asleep, so it’s always best to have some blankets close by for added warmth. Inconsistent sounds throughout the night can really cause disruption to your sleep, so, if you live somewhere with noises you can’t control, like traffic or loud neighbours, then you need to find ways to down them out. White noise machines are a popular way to do this, as the soothing noises help you to relax while shielding you from other sounds. You could also try soothing music, or simply pop in earplugs, to drown out noise completely. TVs, computers, mobile phones, and tablets all emit light that makes it harder for you to fall asleep at night and stay asleep when you finally do. They can also be a great cause of stress, which can also steal your sleep. Because of this, you should consider removing them from your bedroom completely, or, at the very least, make sure they’re off at night. You should also move any clocks, to avoid you spotting the time in the middle of the night and worrying about lost sleep. 8. DO NOT Press Snooze! I know it's the most tempting thing in the world, you wake up to the sound of your alarm and think 'just a few more minutes', hit snooze and fall back into a deeper sleep. Then when you finally get up, you feel all groggy. According to Happy Beds research 57% of us regularly hit snooze. It not only sets you up for a bad morning, but a bad nights sleep! There are so many things in your bedroom that can rob you of a good night’s sleep. Thankfully, there is also a lot that you can do to prevent this, so follow the tips above, and create the sleep haven that dreams are made of.